Established in 2006 by Poet Laureate Donald Berger, the Third Thursday Poetry series has successfully introduced community members to the pleasure of hearing poets read their own work and provided poets with an opportunity to share their poems with the public. 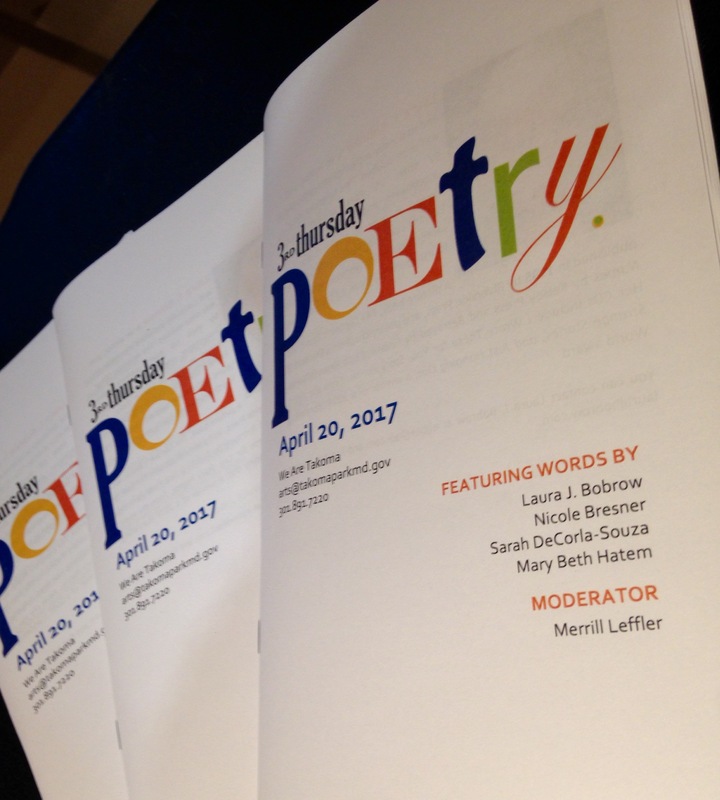 The series has featured poets from across the region reading a variety of forms of poetry. Past poetry readings can be viewed on YouTube. We are no longer accepting submissions for the 2018-2019 reading series. Please check back in 2019 for information on our next call for poets. Submissions are reviewed by Takoma Park’s current and past poet laureates and other local poets. Poetry readings are held on the third Thursday of the month, except July and August. Open readings are held twice a year during the months of June and December. The works of three to four poets are featured each month with each reading being approximately 15 to 20 minutes. The readings begin at 7:30 p.m. and are held in the Takoma Park Community Center Auditorium. An informal reception follows the event. Featured poets receive no compensation but are welcome to make their work available for sale before or after the reading. The Takoma Park Community Center auditorium is located at 7500 Maple Avenue, Takoma Park, MD. The facility is Metro accessible via the Red Line Takoma Station, and is served by the following bus lines: WMATA F4, F6 and RideOn 16, 17, 18, and 25. There is limited free parking available on site. The auditorium has raked seating with a capacity of 160 with two aisles. It is ADA accessible and LEED-CI Silver Certified. The floating wood stage is approximately 18 inches off the floor and is 30 feet wide and 19 feet deep at the center. Two sets of two steps provide access to the stage from the audience. The auditorium is equipped with state of the art lighting and sound system. A lectern and microphone are used during the readings. A black drape for the back of the stage may be used at the discretion of the City. The City will provide technical support for the reading including a sound engineer/lighting technician. Tech support assignments are the sole responsibility of the City. The City reserves the right to record the reading and, without limits or additional compensation, to broadcast, cablecast or in any other way display a video or photographic record of the event, including the use of social media outlets such as You Tube, Facebook, Instagram, and Twitter. The reading may be broadcast live on CityTV (Comcast Channel 13 / Verizon Channel 28), web streamed on the City’s web site, and viewed on YouTube. The City promotes all events on a variety of online and social media outlets: the City of Takoma Park website, CityTV, Facebook, Twitter, Instagram, You Tube, the We Are Takoma e-newsletter, and various cultural arts calendars. Additional promotion efforts may include the distribution of fliers and publication of announcements in the Takoma Park Newsletter and the City Guide. Featured poets are expected to assist in the promotion of the reading by providing and authorizing the use of requested copy, images and available video clips. Merchandise may be sold before or after the reading. Tables (2.5’ x 6’) needed to display any merchandise will be provided upon request. The City assumes no responsibility for the display, storage or safe keeping of any merchandise or the collection of any sale proceeds. The City may cancel or reschedule the reading in the event of inclement weather requiring the closure of the facility, use of the venue by the Takoma Park City Council, or other cause, as determined by the City in its reasonable discretion.